After the great start to the festival on Thursday evening, Friday marked the first full day of the festival. Nice warm sunny weather was a welcome change to the previous year, and meant people were in a great mood right from the start. The Wakes were first up on the main stage. A folk rock band from Glasgow, they get things off to a great start. With songs ranging from straightforward folk-rock to a heavier more punk influenced sound blended with a strong Veltic influence. They sound great and put in a very good performance. While photographing The Wakes, I saw something I haven't seen at a festival before - as well as the photographers there was an artist in the pit, sitting and sketching the band as they played. Something very different but a nice touch. Talking to him afterwards, his name was Peter Farrier and you can see some of his work from the festival on facebook. 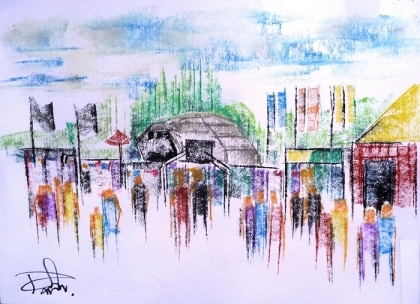 I love the picture he did of the festival site - check it out below. Dizraeli and the small gods were next up and are an interesting act. Fronted by rapper Dizraeli on vocals and beatbox champion Bellatrix, and with a band member manning the turntables you might at first expect a run of the mill hip-hop type act, but then you see that Bellatrix is also playing the double bass while Dizraeli also plays guitar and violin, and it's clear this isnt quite what you expected. It's hip hop meets folk meets psychedelia - an interesting mix. Between bands I took a walk over to the childrens area where something special was happening - school. As many parents have problems getting permission to take the kids out of school for a festival, the awesome people behind Bearded Theory have put together a program of activities that meet the national curriculum requirements which makes it a lot easier to get permission from schools to take kids out for the day as the parents can demonstrate the children will be learning. Children who attend get a certificate to show they attended which they can show their schools. It's not a boring school day though - this is Bearded Theory after all. Instead it's a mix of fun and learning, so the children learn but still have a great time. A brilliant idea from the Bearded Theory team and well done to all the teachers who volunteered their time to run it. Sonic boom six came next. They're another band that don't fit neatly into a single genre, but instead combine rock with hip hop, ska and reggae. it's a diverse mix of styles but the results are great, and the excellent live performance really impresses. Hugh Cornwell was next. As the former frontman of The Stranglers he's responsible for a lot of great songs that we all know and love, and today he played a mixture of Stranglers hits and his own solo material. It's no surprise he draws a good crowd given the nostalgia value of hearing those classic songs played live. Scottish rock band Gun took to the stage with singer Dante Gizzi wearing a leather coat despite the warm sunny weather (I guess sometimes Image is everything). They give us a great set with some really good songs, but inevitably they had to play the song they are or were best known for - their cover of Cameo's "Word up". Another great act. The Alabama 3 came next. Despite the name they aren't from Alabama (unless someone moved Brixton while I wasn't looking), and there aren't just three of them. This was my first time seeing them, and it only took a couple of songs before I was thinking that this was a band I really need to see again. They really are a superb live band, and in keeping with the day are a band that mix up lots of genres of music to produce something special. How special? Well I'm a big fan of the Mission so at the start of the day fully expected them to be the highlight of the day, but Alabama 3 gave them a serious run for their money in terms of the best band of the day - overall I'd call it a dead heat as both were superb. The Mission were tonight's headliners and took to the stage almost invisible in the thick clouds of smoke, but happily it did thin enough for us to see the band were there, even if their drummer was hidden most of the time. The Mission always have a dedicated following so it was no surprise to see a large crowd in front of the stage well before the band set foot on the stage, and it wasn't long before we saw a common sight at Mission gigs - people on the shoulders of friends. It's easy to see why The Mission have such a dedicated following - right from the release of their first album (Gods own medicine) they've been releasing great music and have been an influential band. 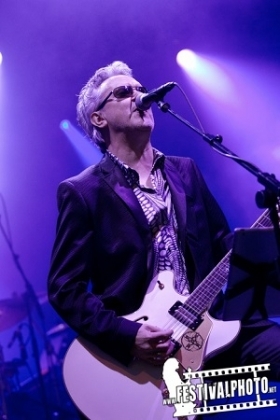 When they announced in 2008 that their four shows in London were to be their last ever gigs, many fans were heartbroken but happily Wayne Hussey reformed the band two years later. With a dozen albums to pick from, The Mission are never going to be short of songs to play, so I was pleased that some of my favourites were in the set tonight. It's a superb set, with the band all being in great form whether they're playing the rockier songs or the slower numbers. The show ended with "Tower of strength" - a perfect end to a great performance and indeed a fantastic day at the festival.